I have just been sent information about a brand new Boro book, about to be published that sounds spot on for your Christmas wish list. Out on Saturday it chronicles Middlesbrough Football Club’s extraordinary highs and lows through the eyes of Teesside legends by Rob Stewart with a foreword by Graeme Souness. More than 100 in-depth interviews with legendary former players and managers adorn Boro Tales. A star-studded cast of club greats, from Lindy Delapenha to Jimmy Floyd Hasselbaink, look back on their Teesside days. As well as revealing the stars’ first-hand accounts of life with Boro, fans won’t know whether to laugh or cry thanks to detailed sections devoted to the heartbreaking 1996-97 ‘Season from Hell’ and the road to Carling Cup glory. The curtain is peeled back at Rockliffe Park to reveal the secrets behind training ground success, which produced FA Youth Cup glory and a famous ‘team full of Premier League Smoggies’, in interviews with ex-academy chief Dave Parnaby, ace scout Ron Bone and talent factory protégés. Unsung heroes and mavericks re-live Ayresome Park and Riverside days, fans chip in with favourite Boro memories and the late Brian Clough, Peter Taylor and Harold Shepherdson’s families fill in missing pieces of the Boro jigsaw with fascinating contributions to a must-read book for Teessiders. Ex-Boro midfield lynchpin Graeme Souness, who is now a highly-respected Sky Sports kicks off the book with a foreword as he takes an emotional walk down Memory Lane. Souness sets the tone by paying a glowing tribute to former team-mates and the people of Teesside and is joined by former club favourites from down the years including England boss Gareth Southgate, the little genius himself, Juninho, Fabrizio Ravanelli, Bryan Robson, Bernie Slaven and Brucey Rioch. There are also interviews with former Boro players who are no longer with us like Delapenha, Rolando Ugolini and Ugo Ehiogu. The families of the late Brian Clough, Peter Taylor and Harold Shepherdson have also helped fill in missing pieces of the Boro jigsaw by contributing to the book. Plus, there are special sections on the club academy, including in-depth interview with ex-academy chief Dave Parnaby and talent-spotter Ron Bone on the secrets behind Rockliffe Park success. And there are sections devoted to the road to the incredible ‘Season from Hell’ when Boro reached two Cup finals and ended up being relegated and then the book ends on a high by focusing on the road to Carling Cup glory. The book has been written by football journalist Rob Stewart, who covered the glory days of the Steve McClaren era for ten years for the Daily Telegraph. “It was an honour to report on Boro’s fortunes during those halcyon days under Steve McClaren and beyond,” said Stewart. “It’s also been a privilege to speak to so many people who have been heroes to Teesside people because they gave their all for the club and played their way into the hearts and minds of supporters. 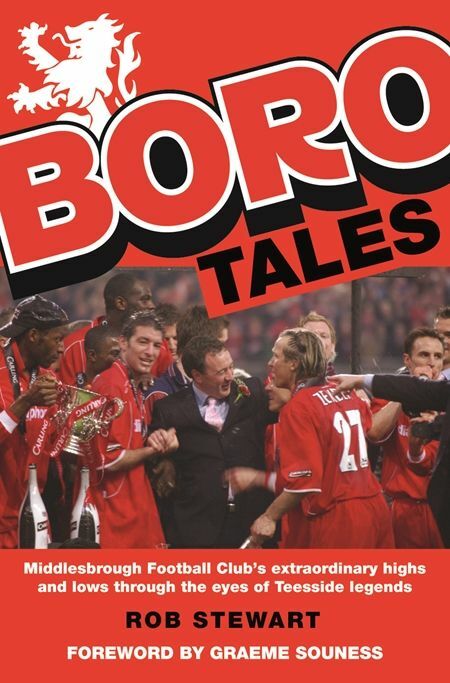 “It was fascinating to get to speak to those who made dreams come true on Teesside as they shared their stories and I am sure fans will enjoy reading their Boro Tales as much as I enjoyed piecing it together. The book also features a section where Boro fans were invited to contribute their personal memories. Boro Tales by Rob Stewart, is published by Great Northern Books, 1st November 2018, RRP £14.99, large paperback, 294 pages.